St Helena Police are currently planning a Parking Enforcement Campaign to address the ongoing issue of parking in Jamestown. All drivers should know what is required of them in relation to parking, however many choose to ignore parking restrictions. Below is information, with diagrams, to remind drivers of some of the parking restrictions in Jamestown. ‘Park’ means to leave a vehicle standing if the vehicle is not actually engaged in taking up or setting down a person or goods. ‘Stand’ means to leave a vehicle standing if the vehicle is actually engaged in taking up or setting down a person or goods. Yellow continuous double lines painted along the edge of the road. A vehicle shall not park or stand at any time on the side of the road on which the lines are painted within the length of such marking. Yellow broken longitudinal line painted along the edge of the road. Unless otherwise provided by markings on the road or by adjacent signs, a vehicle must not be parked (except for the purpose of loading or unloading) on the side of the road on which the line is painted within the length of the marking. (b) with or without other words, figures or symbols for any other purpose. A vehicle must not be parked contrary to the directions specified on the sign. 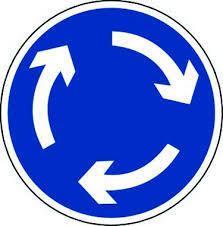 Circular in shape, bearing three white arrows shown in a clockwise direction. When monitoring parking in Jamestown, and approaching a driver about illegal parking, Police Officers have noticed that drivers tend to ask the officer where they should park their vehicles. Drivers are reminded that it is their responsibility to park their vehicle legally. Another response from drivers is to tell Police about other drivers who have parked their vehicle illegally. If this is a genuine concern, drivers are asked to provide an evidential witness statement so that officers can deal with the alleged offender. St Helena Police encourages drivers to park legally and comply with any parking restrictions.